This RIDGID 16 gallon high performance wet dry vacuum is designed to deliver the powerful suction, large capacity, rugged construction, unique features and excellent mobility that pro's demand for jobsite or shop. The powerful 6.5 peak horsepower motor easily handles the toughest jobsite clean-up tasks. 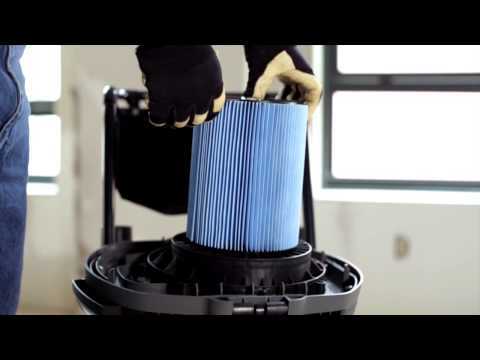 A 3-layer fine dust filter, VF5000 captures drywall dust. Moving up and down steps or across rough terrain is a snap with the large diameter, fixed rear wheels. Add a top handle with a cord wrap, heavy duty 2-piece drum construction, an accessory storage bag attached to a quick release handle plus patented Scroll Noise Reduction for quiet operation and you’ve got a wet dry vac that meets the demands of a Pro. 16 Gallon Wet/Dry Vac With Cart is rated 4.8 out of 5 by 476. Rated 4 out of 5 by roadrunner2 from Good value for the money Good shop vacuum for the money, Well put together. Easy to use. Rated 5 out of 5 by Tyler3679 from Everything you need in a vacuum This wet/dry vac is very powerful, not too loud, and come with tons of extras. I also purchased the auto detailing kit which was the perfect addition to this machine. It is very large to store but definitely worth it!! Rated 5 out of 5 by Woodguy from They got this one right I have used shop vacs for 50 years, and the Ridgid design is one that gets it right. As a wood shop teacher, I have seen a lot of models come and go under hard use. For the price, the Ridgid vac has the features, quality and power that vacuums costing double or triple the cost do not match. It is very powerful, well made and designed, and easy to use, clean and adapt to multiple use needs. You won't go wrong with this one! Rated 3 out of 5 by Jarhead from Good features low power. Has many nice tools that work very well but this Vac does not have the power promised. I have several other vacs that say they have the same power as the Ridgid and they out perform the Ridgid for power. I purchased the Ridgid as they have some outstanding claims. I have used other Ridgid products such as battery operated drills and drivers and they are great. Vacs just not be their specialty. Rated 5 out of 5 by srobi from Very quiet and powerful The power of this vacuum is perfect for my shop. I attach it to any cutting tool I'm working with. The powerful suction and attachments are great for cleaning all areas of my shop. For the size and power it is very quiet. The mobility of the cart is a great feature. Rated 5 out of 5 by SpeedyLube from Great product! This product works great, I use it in my shop to keep it keen and it completes the task easily. At a great price! I have the WD16650 model and want to know if a filter bag is made for it? If a airwatts are 0.117354 * (CFM) * (inches water), then do I calculate correctly that this model no. WD1851 will lift water 12.8 inches high? 306 watts * (1/0.117354) * (1/203 CFM) = 12.8 inches of water I feel like that number is way too low - I'm sure your product lifts water more than 1 foot high! I may have the calculation wrong or the pressure may be specified another way. What do the units of &quot;G/h&quot; mean? Besides, it seems like an odd coincidence that this is almost exactly the inches for model WD4070 when the WD4070 is rated 5.0 peak HP and the model on this page is rated 6.5 peak HP. Thank you for the help. You are right it would lift water more like 10 ft. I registered my vac and I was wondering if that means it is now under warranty? Or do I have to call the number to do that?